Center City, as its name might imply, is the geographical heart of Philadelphia. 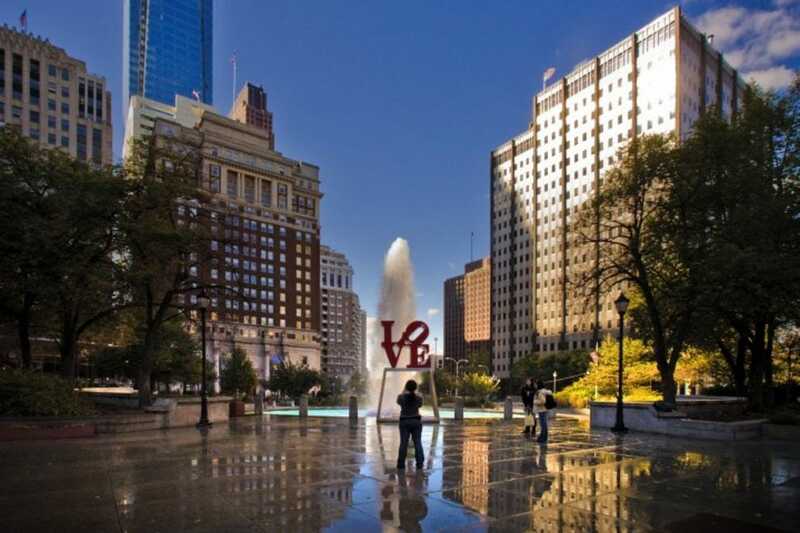 By its broad definition, Center City spans the entire area between the Delaware and the Schuylkill rivers to the east and west and Spring Garden Street to South Street to the north and south. However, some Philadelphians prefer to narrow its boundaries from a district to a neighborhood – one that's centered around City Hall, LOVE Park and the city's corporate corridor along Market Street. Whichever definition you adopt, you'll discover that Center City is bustling with restaurants, shops, hotels, theaters, parks, and public art and performances all through the day and night. If you're searching for the perfect photo op, the ideal spot is at Love Park, also called JFK Plaza. You can strike the perfect romantic or silly pose in front of the iconic Robert Indiana statue for a memorable photo from your time in Philly then stick your toes in the fountain behind it. This postage stamp park also features a striking view of the Philadelphia Museum of Art and is an international mecca for skateboarders. The decor may be refreshingly spare at modern Mediterranean restaurant Barbuzzo but the menu is anything but. Pastas, pizzas, charcuterie boards, small plates, big plates all compete for attention alongside an equally long list of updated classic cocktails, craft beers and wines by the bottle and glass. Dishes like grilled branzino and noodle paella crafted by the expert hands of Chef Marcie Turney (who, with her partner, owns a large handful of other restaurants and shops on the block) make this both a neighborhood cafe for regulars and a specialoccasion spot for foodies from the burbs. As home to the American Theater Arts for Youth, Chamber Orchestra of Philadelphia, Opera Company of Philadelphia, Peter Nero & the Philly Pops, Pennsylvania Ballet, PHILADANCO, Philadelphia Chamber Music Society, and Philadelphia Orchestra, the magnificent Kimmel Center is the cultural heart of the city. Beyond the resident companies, Verizon Hall and the Perelman Theater both play host to performances from Broadway shows to African Jazz ensembles. But there's more to do than just be entertained. Staff runs free building and architecture tours almost every day, and Iron Chef Jose Garces provides all of the center's catering and concessions. If you have business in Center City, it's hard to find accommodations more centrally located than Loews Philadelphia.With special programs for kids and pets, the Loews offers spacious rooms and every amenity imaginable. Sole Food is a ground-level bar and seafood restaurant that draws an after-work and pre-theater crowd. Located between the Liberty Place towers in Center City's hotel district, this sleek shopping complex offers an impressive array of over 60 retail tenants, including Fire & Ice, Les Richards and Swarovski. Completely enclosed, the center is a pleasant escape from the weather outside (especially in the winter), and helps its popularity by hosting a wide slate of special events each season. There's also a food court should you find yourself in need of some afternoon sustenance. Parking is available in the four-level complex located under Liberty Place.